Download our complete “INFORMATION GUIDE” about the 2019 Elleker Half Marathon & 10km Road Race HERE. Online registrations will be taken through Register Now. ONLINE ENTRIES CLOSE: Friday 31st May 2019. LATE ENTRIES will be accepted on Saturday 1st February at Albany Athletics Club Rooms, at the corner of North Rd & Sanford Rd, Albany. Between 10:00am-4:00pm. (Also known at the Mike Biddulph Athletics Ground) And also on Sunday 2nd February at Elleker Hall between 7.00am–8.00am. You must apply in Person Only and Cash Only with a Late Fee of $15 payable. *Please Note: Late Fee DOES NOT apply to 2km Kids Dash event. Bibs available for collection between 10:00am and 4:00pm from Albany Athletics Clubhouse corner of Sanford & North Roads. Late registrations accepted with a fee of $15. 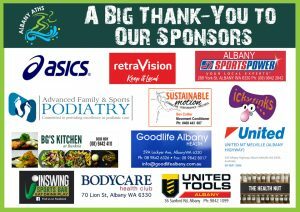 Stay up to date and LIKE our dedicated Elleker Half Marathon & 10km Road Race Facebook Page or head on over and check out Albany Athletics Clubs Facebook Page.